In the ADLER shop you’ll find a whole host of ideas for leisure-related promotional items. Almost all experienced companies print customised promotional gifts, but with our outdoor promotional items your customers and business partners will remember you fondly for a long time to come. For example: once the anorak or sweatshirt featuring your printed company logo has helped protect its wearer against the elements, a permanent bond will be established between them and your products and services! No matter whether that promotional item is used for sport, work or leisure. Many of our satisfied ADLER customers have let us in on a secret: our promotional items for outdoor and leisure time are so popular that their friends often ask where they got them! This means your advertising message doesn’t just reach the gifts actual owner, but also many of their friends and acquaintances. A customised “sporty” text tailored to items from our range of outdoor and leisure products can further optimise memorability. So take your time when selecting a personalised message for your promotional items. No matter which printing process you select for our huge selection of popular and innovative promotional gifts, you are bound to find the perfect solution. Rely on the expertise and extensive experience of our printing specialists – it’s a guarantee for advertising success. Whether you’re looking for new promotional ideas for summer, autumn, winter or spring, a quick browse through our categories is always worth your while! Advertising success with leisure promotional items featuring your logo! Achieve the best possible results with printed promotional items for leisure, outdoor and the workplace with a comprehensive printing consultation from one of our experts. This will help you to economically and effectively design your favourite promotional items with a unique and convincing message. With promotional gifts from our shop, you’ll bring joy to your customers and raise your company’s profile at the same time. Promotional items always improve your customers’, partners’ and employees’ leisure trips. And when your customers visit your company or store, the right promotional gift will help draw attention to your advertising message and give them a pleasant surprise. Leisure trips and vacations in foreign countries are ideal ways of getting your promotional message “out there”. Don’t forget: everyone that uses your promotional merchandise is doing your advertising work for you. So remember, take your time and select the printing message that is right for you, your company and your goals. 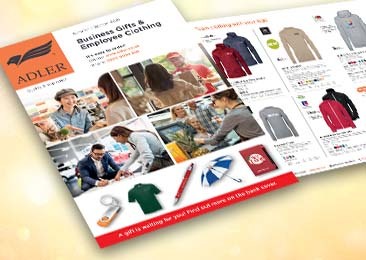 With the top advice from our ADLER printing experts, it only takes a few easy steps to find the perfect leisure item(s) for attracting new customers and for kitting out your business partners and employees for any situation!